In the grim dark of the far-off future, the line between man and machine has certainly blurred. Cyborg implants help the servants of the Emperor with their everyday tasks, from filing things in the grand libraries to taking on the Heretic. The machine-makers are highly revered as they walk off to war. And they're getting a whole new codex you can order from Games Workshop now. 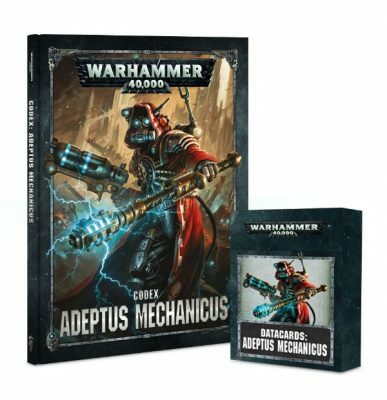 The Adeptus Mechanicus are the keepers and manufacturers of technology for the Imperium of Mankind. It is a role they guard jealously, using their own standing armies, engines of war and god-machines. It is within their power to unleash the most arcane weaponry in the Imperium, and they do so without mercy. Grim processions of soldiers stride in perfect unison, each one a disturbing fusion of man and machine. Behind them stomp soulless automata, and towering over them are enormous walkers. An Adeptus Mechanicus army marching to war is a sight both terrifying and glorious.